Launch pad for the Zenit rocket in Baikonur. Traditionally for the Russian rocketry, the Zenit is assembled and transported to the launch pad in horizontal position on a rail transporter. On the launch pad, designated 11U223, a stationary erector installs the rocket in vertical position. 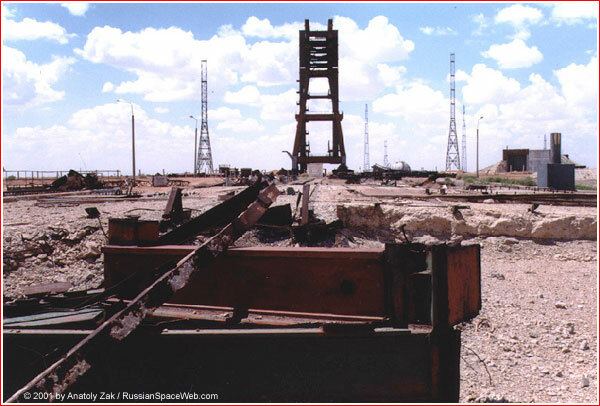 Although the Zenit requires no personnel access when it is in vertical position on the launch pad, both launch pads in Baikonur were designed to be equipped with movable service towers known as "skvorechnik" (bird house). Their purpose was to allow cosmonaut crews to climb aboard a Zenit-launched manned spacecraft, which was expected to replace existing versions of the Soyuz vehicle. At least one of the movable towers, had been largely completed. However a full mass of movable towers for Zenit reportedly exceeded that of movable service towers at the Proton launch complex. Combined with smaller number of wheel buggies which were designed to roll the giant structure back and forth, the pressure onto the track ended up beyond the carrying capacity of standard rails. As a result, larger-than-standard tracks were required and make matters worse, custom-build crossings would be required between standard track used to deliver the rocket and the track used by the tower. The problem apparently remained unresolved at the time of the Soviet collapse. The access towers would be retracted by rail shortly before manned launch. The towers would also provide emergency escape tunnels for the crews in case of on-pad emergencies. The disintegration of the Soviet Union and financial crisis in the Russian space program stalled these plans. At liftoff, as the rocket's main engines reach nominal thrust, its flight control system sends a command to piro-devices to release the attachments of the vehicle to the launch pad. In the next 1.5 seconds, attachments retract allowing the vehicle to move upwards. After the rocket moves up 90 millimeters, fixating devices disconnect from the rocket. 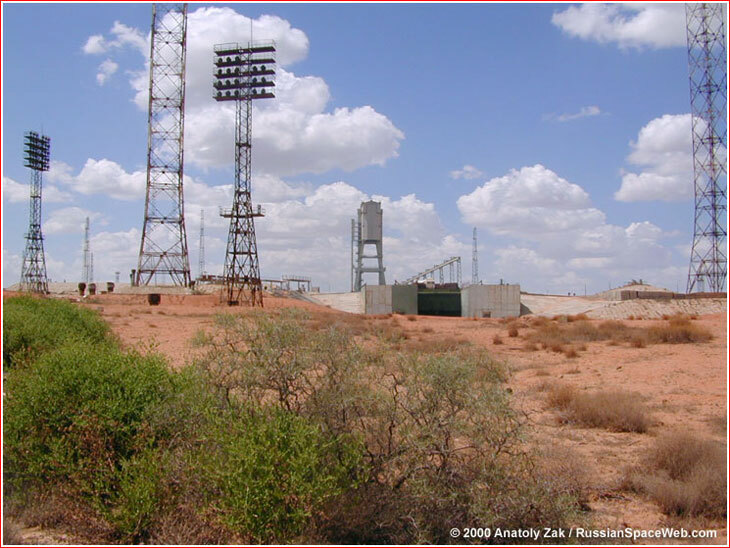 The construction of the Zenit launch complex started at the end of the 1970s on the right flank of Baikonur, where many previous rockets developed by Yuzhnoe Design Bureau were tested in the past. The complex included existing infrastructure, which was refurbished for the new task, as well as newly built facilities. In 1982, the 5th Scientific and Testing Directorate was created in Baikonur specifically for the operations with the Zenit boosters. The Zenit rocket inherited from the past an assembly and processing complex at Site 42, which was previously served R-16 and later R-36-type ballistic missiles. A residential complex for the launch teams serving the Zenit launch facility located in Area 43 and 44. The main town includes apartment blocks, hotel, eatery and communications facility. The first military barracks at the site have been built at the end of the 1950s for the military units testing the R-16 ballistic missile. 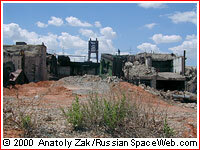 In 1979, the military construction crews started the construction of the launch complex for the Zenit, which continued until mid-1980s. It included two launch pads, known as "left" and "right," a storage for cryogenic propellant and 50 other elements providing automated preparation of the vehicle. All operations of the erecting of the vehicle on the pad, connecting fueling interfaces, as well as deactivation of the vehicle after aborted launch could be conducted automatically. 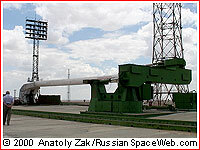 The "left" launch pad was completed in 1984 and it hosted the first Zenit launch on April 13, 1985. The "right" launch pad was completed by 1990, the first launch from the pad took place on May 22 of that year. On October 4, 1990, during its 14th launch, the Zenit's first stage failed five seconds after the liftoff from the "right" launch complex at Site 45. According to eyewitnesses, the launch vehicle lifted to an altitude of about 70 meters, froze in the air for a fraction of a second and then started slowly falling back to the pad. A flame burst to the side from the tail section of the rocket as it collapsed back into the flame trench, directly below the launch pad. The enormous explosion and fire followed. The shockwave from the explosion lifted a 1,000-ton metal body of the launch structure as high as 20 meters from the surface and then crashed it down to the ground. The debris from the rocket weighing from two to three tons were scattered around the complex as far as two to three kilometers from the epicenter. The payload, apparently a Tselina signal-intelligence satellite, crashed 300 meters from the launch pad. The fire raged on the pad for several hours as night fell over Baikonur. Two subsequent Zenit launches after the accident on October 4, 1990, also resulted in failures, however, none of them damaged the pad. Finally, on November 17, 1992, which reportedly could be the last for the Zenit rocket if it had not succeeded, the vehicle performed flawlessly. 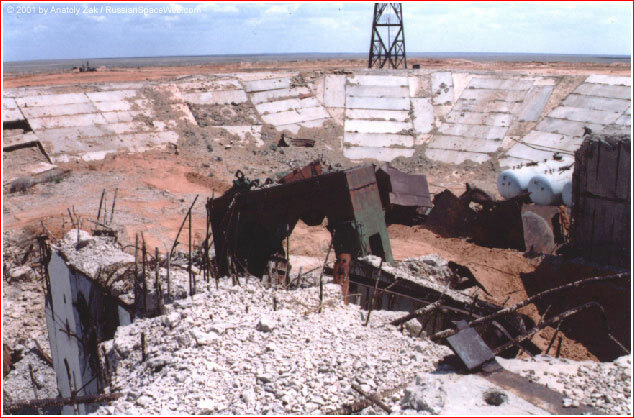 In nearly three decades after the accident, the badly damaged "right" pad remained out of service and all subsequent Zenit missions were originating from the "left" pad. In 1998, ground operations with Zenit rockets were transferred from the military to the civilian authorities, including launches of the classified Tselina satellites. At the beginning of the 21st century, the success of the Sea Launch venture, which involved the Zenit-3SL rocket delivering commercial satellites from the ocean-based platform, enabled investments into the Zenit rocket launch infrastructure in Baikonur. The project known as Land Launch or Desert Launch envisioned bringing a three-stage Zenit-3SL rocket to Baikonur in addition to a two-stage Zenit-2. On December 20, 2006, a new version of the Zenit rocket, known as Zenit-2M, was rolled out to the launch pad at Site 45 for integration tests. The first launch of the Zenit-2M took place on June 29, 2007. On Dec. 5, 2012, the head of the Kazakh space agency, Kazkosmos, Talgat Musabaev told the Interfax new agency that his country had dropped plans for bringing the Angara rocket to Baikonur under the Baiterek project due to its escalating cost and the refusal of Russia to participate in its funding. Russian plans to build a launch pad for the Angara rocket in Vostochny Cosmodrome on its own territory further undermined the economic feasibility of the Baiterek venture. According to Musabaev, Kazakh officials were conducting serious negotiations to form a new joint venture with Russia around the Zenit launcher. In December 2013, the RIA Novosti news agency quoted the deputy head of the Kazakh space agency, Kazkosmos, Meirbek Moldabekov as saying that by the end of 2014, Kazakhstan had planned to take over operations of the Zenit rocket in Baikonur from Russia. These plans had never materialized due to the Russian-Ukrainian conflict of 2014, which interrupted the production of Zenit rockets. According to a Russian-Kazakh agreement struck in 2017, the control over the Zenit launch facility would be transferred to Kazakhstan by Jan. 1, 2018. By that time, the two sides planned to refurbish the launch complex for a new rocket conceived within the Sunkar concept, later renamed Soyuz-5. On Aug. 22, 2018, Director General of Roskosmos State Corporation Dmitry Rogozin and the Minister of Defense and Aerospace Industry of Kazakhstan Beibut Atamkulov signed a protocol on the changes and amendments to the 2004 agreement on the Baiterek complex. The document officially confirmed that the Baiterek project would now rely on the future Soyuz-5 rocket based at the launch infrastructure of the Zenit-M complex in Baikonur. 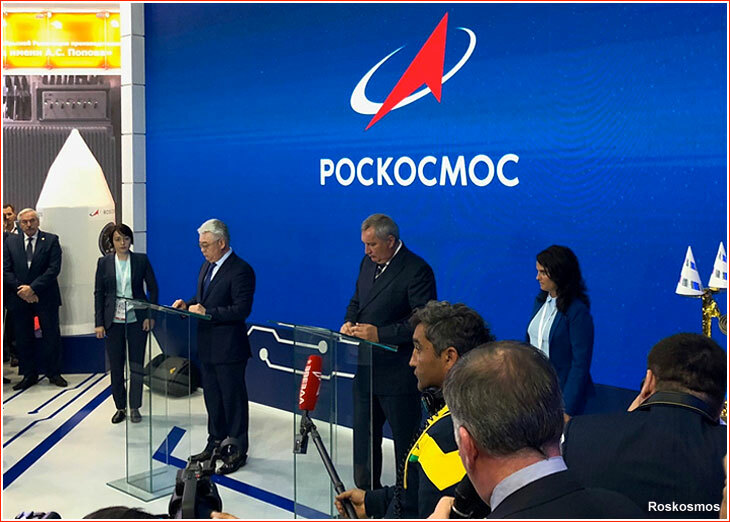 According to Roskosmos, during the signing of the protocol at the Armiya-2018 military industry show, the two sides reconfirmed their commitment to the Baiterek project and discussed deadlines in the implementation of its main phases. A Zenit-2 booster blasts off from Baikonur's Site 45 carrying a Yenisei-2 classified imaging satellite.